Finding the Phillies in that list requires more scrolling than I would’ve liked. 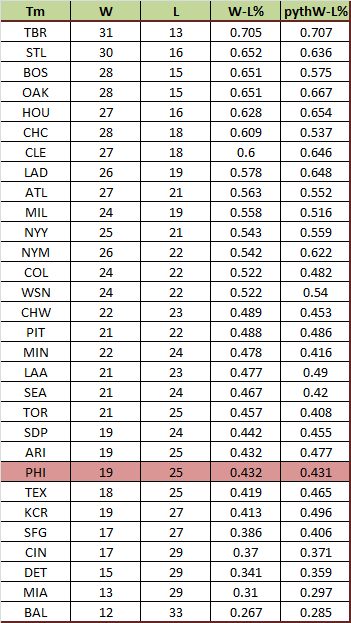 They’ve played better as of late, but the two-month long skid has the Phillies outside the playoff picture looking in. With 11 games left, they are 6 games out of both the Division lead and the Wild Card… but it isn’t over yet. The scheduling gods have given us a blessing…or a potential curse. 7 of the final 11 games are against Atlanta. The other 4? Why, those would be on the road – against Colorado, one of the teams we’re chasing in the Wild Card race. Every win (and every loss) counts for double from here on out. Even going a respectable 4-3 against Atlanta will eliminate the Phillies from the division. If there’s a time for a win streak, it’s right. now. 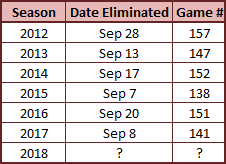 If the Phillies fail to reach the postseason (reality check: this will probably happen), it will be the 7th consecutive year they’ve failed to do so. Bright side: the Phillies haven’t been relevant this late in the season since 2012. The Phillies have played 151 games and are still in it. The earliest they can be completely eliminated from the postseason is Sunday, September 23 – Game #155. Think about it. You haven’t even CARED about Phillies baseball this late in the season for over half a decade. Does it hurt that they tailed off so hard? Yes. Does the future look brighter? Also yes. At the end of the day, we’re looking for sports to entertain us, and that we care means they’ve succeeded in entertaining us to this point. The path to the postseason is narrow. I hope they can walk it – failing that, I hope they can at least fall close to the finish line. Standout Hitter: Aaron Altherr. THIS is the Aaron Altherr I had wanted to see…well, realistically, this is more than what I expected, but the point is that I expected “good” and not “bad” out of Altherr. He had 20 PA and reached base in half of them. He added in 2 homers, 2 doubles, and 2 stolen bases for good measure. Maybe the time in the minors helped him refocus his approach. He’s flashed potential in the past – we’ll see if that’s enough to keep him around for the future. Standout Pitcher: Zach Eflin. For weeks since his “recall”, Eflin looked lost on the mound. Over four starts, he got rocked to an 8.64 ERA. His season, once promising, took a turn for the disappointing. This past week bucked that trend – 11.1 IP, and a 0.79 ERA in two winning efforts. More, please. Sit-Down Hitter: Roman Quinn. For the season, Quinn has been awesome – an 0.836 OPS with 8 SB and plus defense in a little over 100 PA. His performance thus far makes an already crowded outfield even more crowdeder (joining Hoskins, Herrera, Williams, Altherr, and Cozens). For the week, though, Quinn has been less so – 7 strikeouts in 20 PA will do that to you. I’m not worried about him. He has been too good outside of this week to worry just yet. Sit-Down Pitcher: Vince Velasquez. One ineffective start (2 IP, 4 ER) in the middle of a division race…Velasquez NEEDS to be “good” Vince in his next couple of starts. The Phillies playoff hopes depend on it. If you like baseball (….why else would you be here?…) and enjoy amusing doodles, you’ll enjoy “Acceptably Drawn Baseball”. If you like baseball (you may have already answered this question about 15 seconds ago), you’ll probably like “Out of Context Baseball”. Christian Yelich has hit for a cycle – twice. Within 3 weeks of each other. Against the Reds. That’s his second best performance of the season, after playing Benny “The Jet” Rodriguez. Aaron Judge continues to be a gift. I love a good slide. People should slide good more and bad less. Brilliant writing by Grant Brisbee about the Home Run chase and how caught up in it everyone was. Take some time to read it, it’s worth your while.